Running a hospital, clinic, family practice, or Healthcare office is a difficult job. In addition to providing great Healthcare and services to your patients, you also have to keep up with new research in your field, investigate new medications, look at files from fellow Healthcare providers needing a second opinion, and maintain your own continuing education in the field. Then there’s the hours of paperwork, the inventory, and the behind-the-scenes work like bill paying and employee training that all take up even more of your time. It’s no wonder so many doctors have barely any time to spend in the examination room with a patient. Wouldn’t you like to be able to give more time to your patients, and spend less time with all that other stuff? With a Healthcare records archival service, you can do just that. Healthcare records can be tricky, because they require certain types of storage to meet privacy laws. They also must be disposed of in the proper manner when the time comes, and that can also take up time. 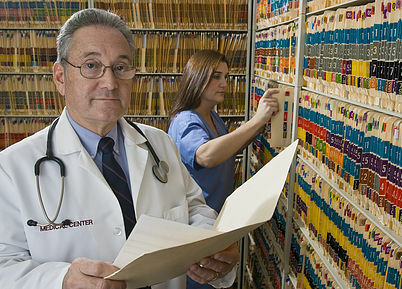 A Healthcare records archival service can take care of all of that for you. The right service will be able to gather your documents and files, scan them for a digital archive, store the information in a secure manner, and destroy it thoroughly when necessary. All of this means that you get to spend more time face-to-face with the reason you became a Healthcare professional, while the Healthcare records archival services take care of the other parts. You may even find a service that stores the paper versions of old records as well, until disposal becomes necessary or convenient. Choosing the right Healthcare records archival services will make these decisions easy and painless. eRecordsUSA is specialized in providing Healthcare Records Archival Services / Healthcare Records Archiving Service / Healthcare Records Scanning Service. Would you like to receive a free quote to archive your healthcare records? Call +1.855.722.6669 or eMail us at info@eRecordsUSA.com. eRecordsUSA offer Healthcare Records Archival Services in following areas of California, Santa Clara, Sunnyvale, San Mateo, San Francisco, Mountain View, San Jose, Redwood City, Silicon Valley, Marin East Bay: Alameda, San Ramon, Concord, Pleasanton, Fremont, Hayward, Milpitas, Oakland, Contra Costa, Livermore, Dublin, Napa Valley: Santa Rosa, Pittsburg, Fairfield, Sonoma, Petaluma, Vallejo, Solano & Martinez.